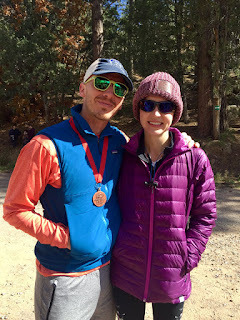 Yesterday morning Jaycob and I raced in the 2nd annual 10K Tatonka Trail Run in Glorieta, New Mexico. It was quite a different experience compared to last year, when my very-pregnant self walked the 5K course! It was fun to be able to run it this year while Ady spent the morning with her babysitter. I haven't been doing a lot of trail running since having the baby, but it was a beautiful day for a run and the trails were fun with lots of ups and downs and bright fall colors in their prime. It was a chilly morning but warmed up during the race. My goal was to run the whole race without walking (done! ), and also to finish before all the cupcakes were gone (check!). I have high ambitions. Admittedly, I was not very prepared for the intensity of the race, nor did I mentally prep for a run that would take me that long, but I feel a sense of accomplishment afterwards. (Not to mention a sense of delayed onset muscle soreness.) Jaycob had a great race and got the bronze medal!